South African bags a major!! Trevor Immelman won the US Masters early this morning South African time. Although he had a bumpy fourth round (so did everybody else) he held on and beat Tiger by 3 shots. This is the first time since, I think, 1976 that somebody won the US Masters leading from the start. Trevor was the leader at the end of each and every round. Another interesting fact is that it is the first tournament this year that Tiger entered and did not win. He got damn close but Trevor did enough in the first 3 rounds to keep him out. And how about the Stormers? Lets hope they can keep it up in their next couple of games and move up to at least 4th on the log to play in the semi’s. 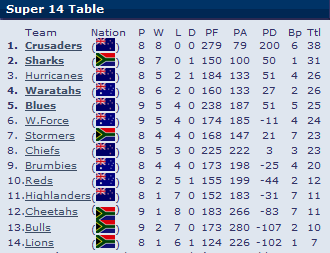 Here is the log after this weekend’s games. As you can see, about nothing between 3rd and 8th position on the log. This entry was posted in South Africa, Sport and tagged Golf, rugby, stormers, super 14, tiger woods, trevor immelman, us masters by Marius. Bookmark the permalink. ← Previous Previous post: New challenges and change. Next → Next post: The moon, rugby and friendship.